Coleraine Football Club say they will ‘actively pursue the person or persons’ whose behaviour has landed the club a £500 fine. The Bannsiders were hit with a charge by the IFA after items were thrown on to the pitch during the Danske Bank Premiership game at home to Glenavon in March. The club has appealed for information from fans who were at the game to help identify the culprits. “During the Danske Bank Irish Premiership game against Glenavon on March 26 items were thrown on to the pitch by a person or persons in the Railway End stand,” a club statement said. “The Club acknowledges the overwhelming majority of our fans in attendance were quick to condemn the culprit and displayed exemplary behaviour throughout the match, we nevertheless find ourselves subject to an unwelcome disciplinary charge. “Coleraine FC encourages fans who witnessed the antisocial behaviour to contact the club to assist with the investigation. “Please forward relevant information via email (secretary@colerainefc.com) or telephone 028 7035 3655. “Culprits identified by the club’s investigation will be dealt with according to the terms of the Coleraine FC Code of Conduct. “The club will also actively pursue the person or persons involved for the amount the club has been fined. “Coleraine FC remains fully committed to ensuring the Coleraine Showground is a safe and welcoming environment and will continue to work with statutory bodies to improve match day safety. Coleraine are following in the example of fellow Danske Bank Premiership club Cliftonville, who demanded a fan comes forward to pay a £500 fine for lighting a flare during a match. 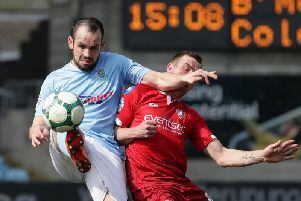 Cliftonville were hit by a hefty fine after the footie fan lit a flare at an Irish Cup clash at Solitude also in March. The home side were beaten 3-0 by Linfield on the day, but the IFA fine was another body blow for the club in the days after the match. The statement, released by the Reds, said the fan’s failure to settle the debt would affect “other strands of day-to-day activity” within the club.